Very friendly Host. She is extremely friendly and helpful. With the kitchen equipment I still managed to make lobster to treat my wife and old friends. It's near to the Naschmarkt, there I got the lobster. This location is nice, but may get lost in the night without GPS. I will stay there next time. BTW. Kitchen has no knife... I bought a cheap knife for cutting, next time I bring mine. The apt is very clean and spacious. Great for 6 people. Fully kitchen and air conditioning. Nice furniture and quite neighborhood. Very high speed Internet and the host is really lovely and very cooperative. They let us checkout at 2 pm to compensate. Grocery store close by. Very good place for family accommodation. Very good communication near U4 metro station. Many honest owners. They have fulfilled the promise. Flat was spacey. Location was very nice. A lot of natural light. Grocery store is right in front of the Building. Staff is very nice and responsive. SUPERMERCADO ENFRENTE. EDIFICIO PRECIOSO. SUELO PARQUET Y CALEFACCÓN CENTRAL. Das Viertel (Margarethen) in Wien war genau da wo wir wohnen wollten, gute Verkehrsanbindung. El hotel está muy bien ubicado y tiene dos supermercados cerca,al igual que la estación de metro. Большая квартира с удобной планировкой. В столовой- гостинной хороший большой диван, вся семья по вечерам собиралась там, было где посидеть и полежать ) телевизор не смотрели, но русских каналов кажется не было. Wi-Fi работал хорошо везде, кроме одной спальни. На кухне достаточно посуды, кастрюль и сковородок, а также приборов и бокалов. Большая посудомоечная машина, 4-х комфорочная плита, духовка, чайник, кофе-машина. Единственное не работала вытяжка, но в остальном набор на кухне отличный, есть с чем сравнивать. Квартира находится на 4-м этаже, лифта нет ) Прям напротив подъезда вход в сетевой магазин Hofer, до Spar 100 метров. В центр ездили на такси: туда 8-9 евро, обратно 10-12. До метро минут 5 пешком. В общем нам понравилось, если снова соберемся в Вену, быстрее всего, снова выберем этот вариант. 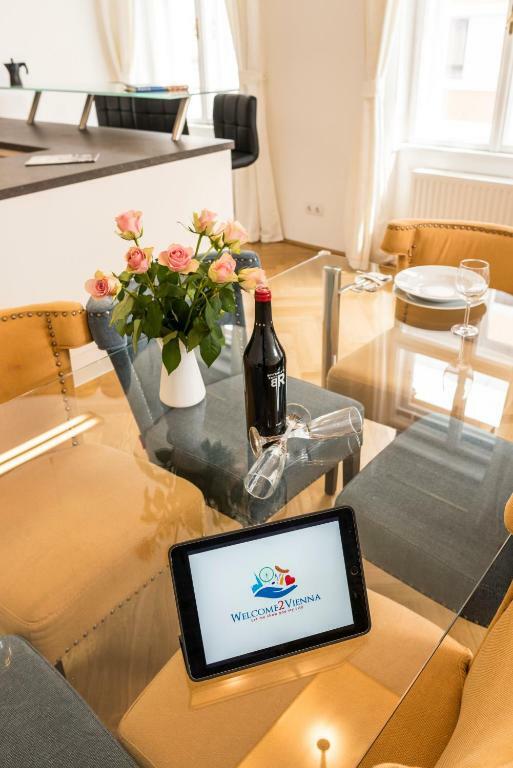 Located within a 16-minute walk of Haus des Meeres and 1.4 miles of Vienna State Opera in Vienna, Executive Suites Margareten by welcome2vienna has accommodations with seating area. Free WiFi is featured. 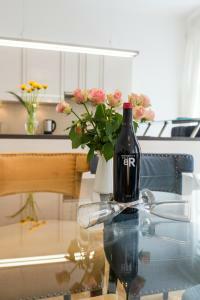 All self-catered units feature hardwood floors and are fitted with a flat-screen TV, an equipped kitchen with a dishwasher, and a private bathroom with bath or shower. There's also a oven, microwave and a coffee machine. Musikverein is 1.8 miles from the apartment, while Karlskirche is 1.8 miles away. Schwechat Airport is 13 miles from the property. 05. Margareten is a great choice for travelers interested in convenient public transportation, city walks and old-town exploration. 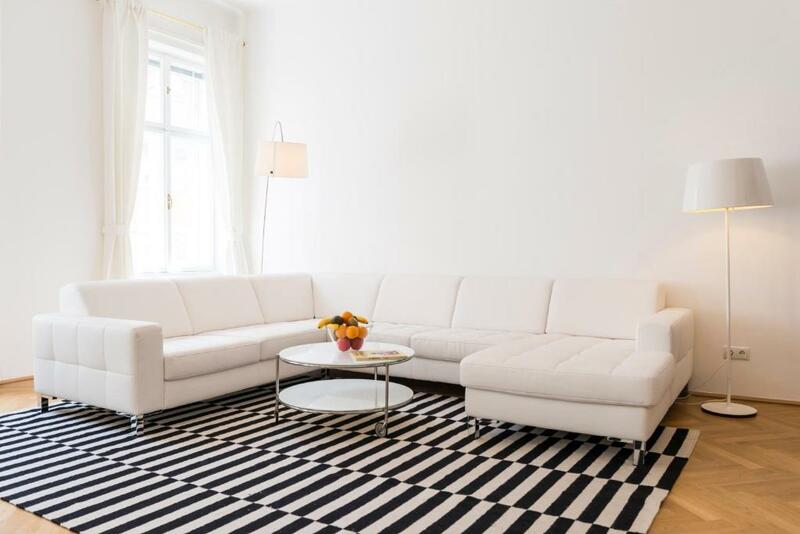 뀐 Located in the top-rated area in Vienna, this property has an excellent location score of 8.1! When would you like to stay at Executive Suites Margareten by welcome2vienna? 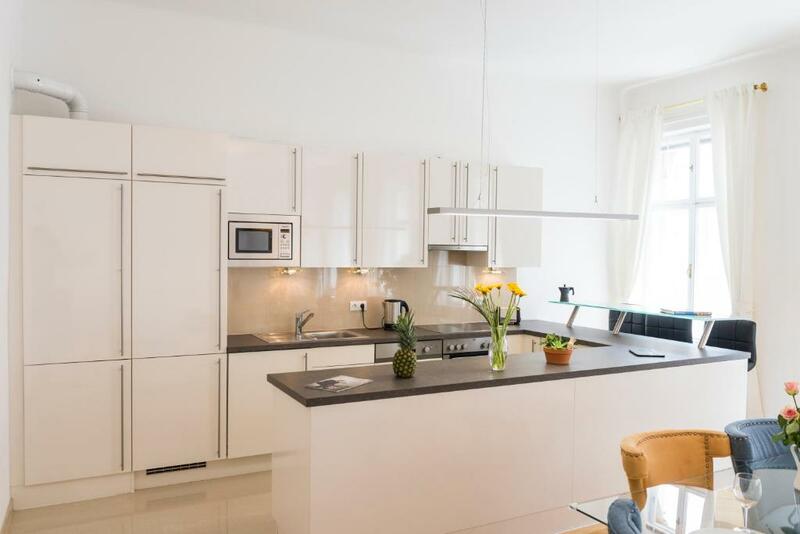 This apartment features a kitchenware, stovetop and dining area. 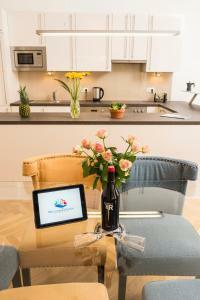 This apartment has a dining area, air conditioning and soundproofing. Feel at home in our modern, charming Executive Suites Margareten apartment in the 5th district of Vienna. 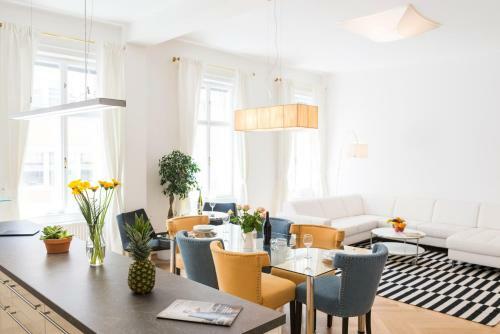 With a living space of 60 square meters, the stylish and lovingly decorated apartment offers space for up to 4 guests, in a comfortable double bed in the bedroom and a pull-out sofa in the living room. 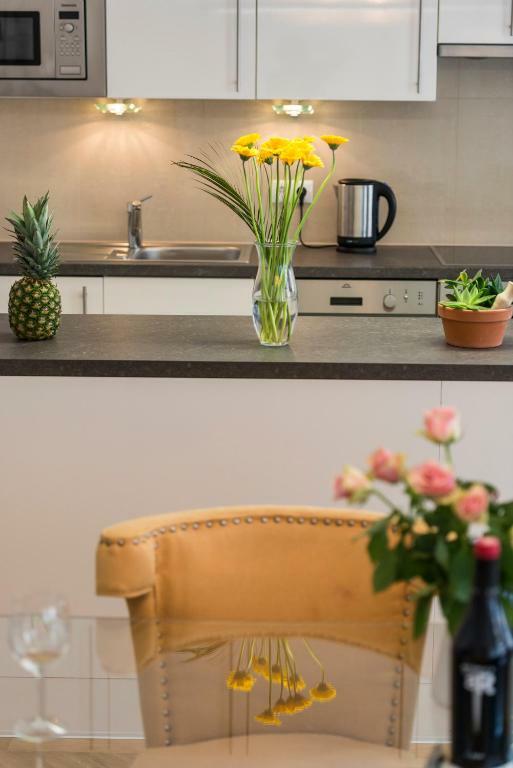 The fully-equipped kitchen enables you to enjoy a home-cooked meal before or after a day of adventures and exploring the city. The kitchen and dining area are part of the charming living room. The modern bathroom is equipped with a bathtub, and a walk-in closet offers ample space for all of your belongings. 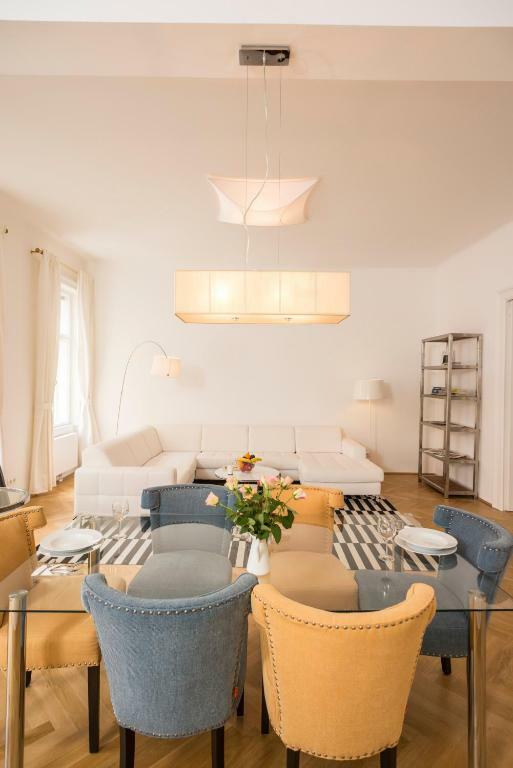 The apartment’s location near the city centre make it a great starting point to see and experience Vienna and one of its local districts. Wifi is available and provided free of charge through out the apartment. Airport shuttle can be arranged upon request. Ps. 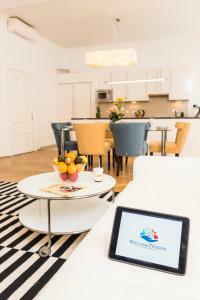 We rent two Executive Suites Margareten apartments, identical in size and equipment. 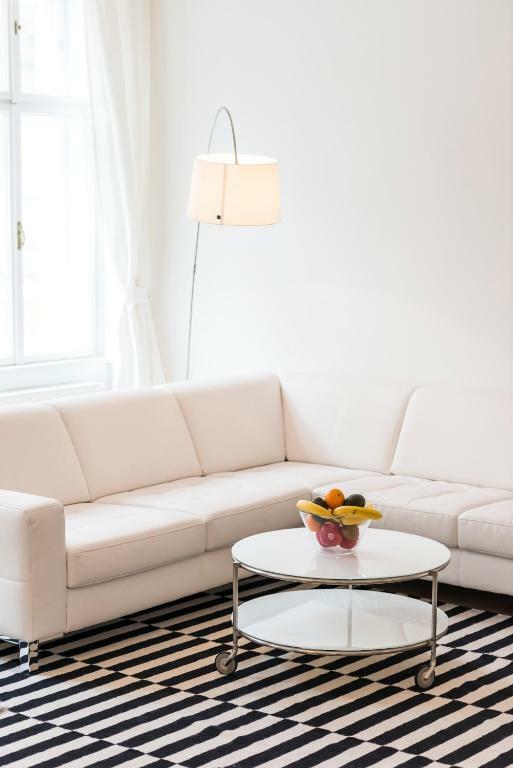 The only difference is in the details, the designer furniture pieces and the colour nuances. Feel free to check out both apartments and decide for yourself, which design and style appeals to you more. Welcome2vienna is relatively young project with the main idea to create ‘home away from home’ for travelers, offering number of services to help make their stay as enjoyable and delightful. Our vision is not just to provide accommodation, but to offer warm welcome to everyone who comes to explore our wonderful city! We are a very vibrant, multicultural team of people who work close together to make your experience of Vienna pleasurable and gratifying. With the main agenda to create a forthcoming and trustworthy relationship with customers our team stands prepared to meet your needs requests, wishes and preferences. 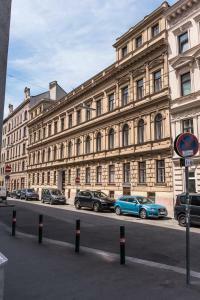 The apartment is located in Bräuhausgasse, a smaller street parallel to the main street Rechte Wienzeile. If you stroll down this street, you will arrive at the Naschmarkt in 15 minutes, and the city centre in 25 minutes. If you cross over both the Rechte and Linke Wienzeile, you will already find yourself in the equally charming 6th district. Directly across from the apartment, you will find the supermarket Hofer. The metro station Pilgramgasse, which connects you to the U4 is just 5 minutes walking from your door. The U4 will take you directly to the beautiful Schönbrunn Palace and Gardens Complex, a must-see sight during your visit to Vienna. If you take the line in the opposite direction, you will find yourself in the city centre in just a few minutes. 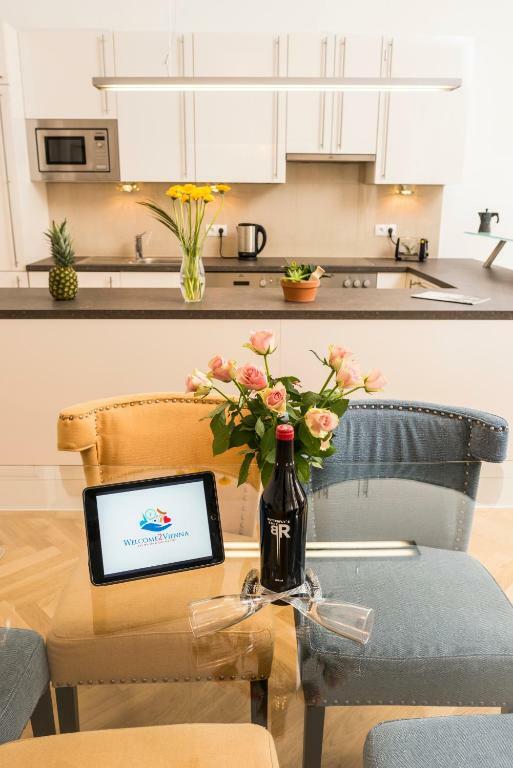 House Rules Executive Suites Margareten by welcome2vienna takes special requests – add in the next step! A EUR250 damage deposit is required on arrival (around USD281.09). This deposit will be fully refunded at check-out, as long as there isn't any damage to the property. 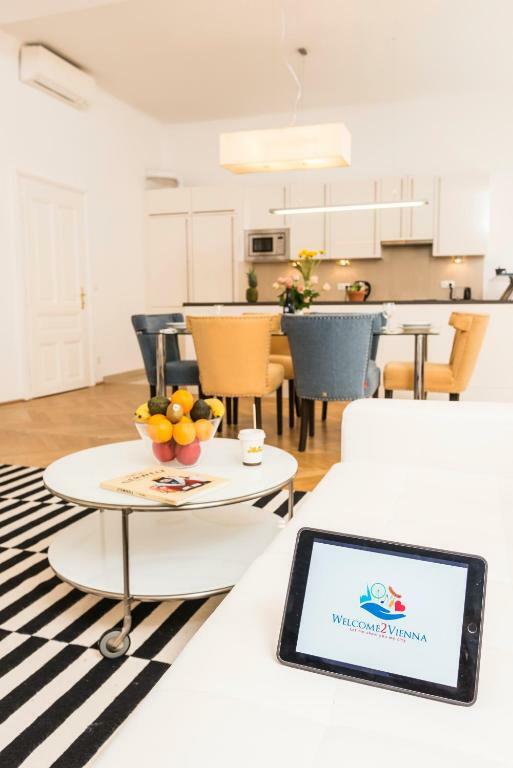 Executive Suites Margareten by welcome2vienna accepts these cards and reserves the right to temporarily hold an amount prior to arrival. A damage deposit of EUR 250 is required on arrival. That's about 281.09USD. This will be collected by credit card. You should be reimbursed on check-out. Your deposit will be refunded in full by credit card, subject to an inspection of the property. 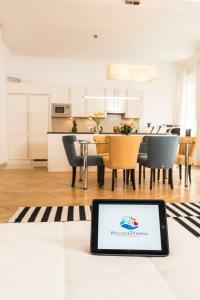 Please inform Executive Suites Margareten by welcome2vienna of your expected arrival time in advance. You can use the Special Requests box when booking, or contact the property directly using the contact details in your confirmation. Some rooms are not clean enough spider webs , would be more helpful to give some information about the city and transport. No elevator which is really hard if you have much luggage and the apt is in the second floor with high stairs. No parking at all and you have to park about 7 minutes walk and very expensive full day for 24 euros. Kitchen facilities were missing. The Sofa was a bit dirty. There was no shampoo or soap in the main Bathroom. There was no parking garage near by. Nobody said anything about the EXTRA DEPOSIT OF 250.- Euros per appartment !!! The deposit was not ment for the rent, but as a security deposit against vandalism or something of that sort.... as a frequent traveller I never had to deposit such an amount !!!! Although the property is described as having a parking space, the fact is there is no one available in the area (for an hour you can park in the Hofer underground parking garage- next to the property). For longer stay, you should choose a Park and Ride facility (3 days cots around 10 euro at Erdberg P+R facility). They took full payment before we left home. It was supposed to be upon arrival at the apartment. I would have paid in euros instead of losing with exchange rate on my credit card. they also took a deposit of 250 euros upon arrival. 60 euros for cleaning fees is way too much. Wifi very weak. Days without being able to use it and when we could it was only one phone or tablet at a time. TV only has 2 English channels we can watch (CNN AND BBC). Just few days before arrival, they changed the location of the apartment 1.5 km further to center. Having booked 7 months in advance, and Executive Suites charging us in advance for this room, when we arrived they had given our room to someone who wanted to stay a little longer. We were forced to a different address. The room was a disgrace. The bed was squeezed tight (tight! Photo attached.) between 2 walls and we had to crawl down the bed to get in and out. Try doing that after hip surgery. The apartment we were moved to didn't have the same amenities as the one we had paid for, particularly the dryer we depended on at this stage of our journey. The management is opportunistic, dishonest and greedy. No compensation offered, just a "this is all we have." They had our money and were keeping it all. What a disgrace. Nothing to like here. The business is a scam. They tried to charge us 60 € cleaning fee for one night!!! Even 20€ cleaning fee that they agreed with on the end was a total rip off!